Being a writer is no longer just about being able to put pen to paper. Lucky for us writers there's an increasing amount of applications to make things easier and help us in our writing careers. Technology advances, and all writers either own or at least know about little gadgets like the Kindle, Ipad, Smartphones and Nook. Nielsen did research into the consumer market for connected devices and found out some interesting facts e.g. 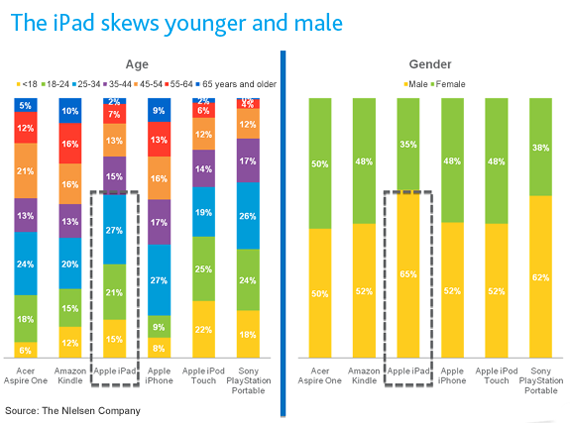 ipad tend to be male and most are under the age of 35. A list of useful applications for the ipad especially for writers can be found at the Gadget Cage site. It's also important these days to know if your website is performing optimally, and that the content is penetrating your target markets. Analytic tools can help writers keep track. A selection of the top tools and add ons of 2010 can be found at the Tech Line Info site. Writers need to improve their skills and evolve to make sure writing assignments keep on rolling in. An easy was to do this is to take part in courses and workshops designed for writers. A huge list of online courses can be found at the Writers Digest University site. Diploma Guide has a great list of 30 useful tools for writers ranging from calendars and project planners to writing and editing applications. If you're not sure where to start, try checking out this list of 100 open source tools that can make your life as a writer easier. If you know of a fantastic application or tool that hasn't been covered here, tell us about it in the comments section.